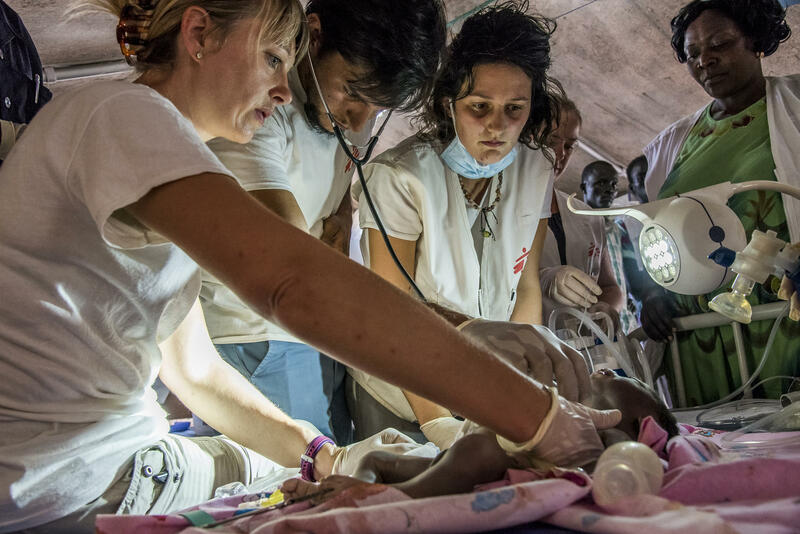 MSF’s project in South Sudan's Leer and Mayendit counties started after most of the people in a town in the north had to flee due to civil war. The project has several small clinics situated in rural areas where the population has no access to even the most basic of medical services, such as being able to see a doctor or a chemist. While I was working here as a nurse, five of us international MSF staff (two logisticians, a midwife, a health promoter and me) organised a trip to the southern islands – areas of raised land that are surrounded by a vast area of swamp. The trip had been organised to support MSF’s South Sudanese clinical staff with training and guidance, and to resupply the clinic with much-needed medication. With a fierce sun beating down and the weight of heavy backpacks, things began to get uncomfortable. Little did we know that things would get worse. As a result of dubious security in the area and annual flooding, the clinic had not been visited for nearly a year. The islands had been previously used by fishermen, but due to the local security issues, many families had fled to the islands to seek refuge from the violence. Our journey began with a flight in a light aircraft, which was the only means of safe and rapid access to the community. After landing in a field in a small village, we then faced a three-hour trek across grasslands and swamp to the first island. The trip, like many in the field, was for several days. We had to transport camping equipment and food for the duration of our trip, as well as medicine for the clinics. As there were no roads or local transport facilities whatsoever, and the amount of equipment and supplies for the clinic was too much for the team to carry, we hired some local women as porters to carry it overland. We set off in forty-five-degree heat shortly after midday. The first hour or so travelling over decent terrain was reasonably comfortable, but with a fierce African sun beating down and the weight of heavy backpacks, things began to get uncomfortable. Little did we know that things would get worse. We arrived at the swampland to find that there were no canoes or boats to help us across the first stage. The swamp itself was a murky chocolate brown colour, teeming with wildlife. I wondered what lurked beneath the surface. We couldn’t see anything. We knew there were fish, but what else? As we waded in, the water was soon above my knees and I wondered what lurked beneath the surface. We couldn’t see anything. We knew there were fish, but what else? The porters made walking through the swamp look easy. Many of them are very tall and would not have looked out of place on a fashion catwalk. The women dwarfed our staff and were no doubt greatly amused by our less-than-refined efforts as we tripped and stumbled through the reeds, complaining constantly about the putrid smell of rotting vegetation within the swamp. After what seemed an eternity, we gained some respite on a small area of dry land. Our relief was short-lived, and before long we had to face the rigours of the swamp once more. However, by chance, a small canoe appeared, and we were transported across deeper areas of the swamp. Unfortunately, not everyone could fit in the small canoe. So, one of the clinic staff made a smaller canoe out of plastic sheeting to carry one of the international staff. This worked for a while, but it became submerged and so he had to continue the journey wading through the swamp. Soon, we all had to wade yet again. At times, the water was chest-deep and we had to carry our backpacks above our heads. Thankfully, we had waterproofed everything. Eventually, we reached another small island inhabited by a local community who greeted us with singing and dancing. It was late and getting dark, and we were all very hungry and tired, having had nothing to eat since our departure. Three of the five international staff were suffering from leg cramps and we all looked very much the worse for wear. Our pleas for a brief stop were met with the response that we were in the middle of the swamp: there was nowhere to rest. The local women porters left us and continued onward, carrying our equipment and supplies. They were from a village near where we had begun the journey hours before and needed to return that night. Some local staff remained to support us and informed us that it would only take one more hour to reach the next island. However, what should have been a three-hour trip in total had so far taken us five hours simply to reach the first inhabited island. We were all totally fed up with the swamp and there was yet more to come without the relative comfort and respite of a canoe. I was exhausted, and I fell several times, often becoming completely submerged in the stinking water. The South Sudanese staff were very patient and understanding. They were all tall with long legs and used to walking through swamps. They carried as much of our kit as they could manage. One of my colleagues in front of me was being supported and half-carried by a member of the local staff who was already almost hidden under the burden of three of our personal bags. Our pleas for a brief stop were met with the response that we were in the middle of the swamp: there was nowhere to rest. One of the local team forged ahead and found a termite hill on a small island sticking out of the swamp where we were able to gain brief respite. However, we were advised that it was not safe to remain long. We were greeted with rapturous applause, singing and dancing, with small excited children all wanting to shake our hands. We were suffering from cramps, blisters and low blood sugar levels. Fortunately, one of the team had had the foresight to pack some sugary sweets in his grab bag. Our morale was low, and it was getting late. To make matters worse, the mosquitoes were beginning to bite, adding to our discomfort. However, after our sugar boost, we were ready for the last push forward. The local women porters marched on past us as they headed home, and our kit was waiting for us when we arrived at the clinic. We later found out that it had taken them a further two hours to make it back to their village. As we continued onwards ourselves, I spotted a small green snake wrapped around a reed stem. I wondered if it was dangerous despite its small size. I did not want to dwell on what other creatures were present, lurking in the fetid depths of the swamp. Eventually, and in complete darkness, we arrived at our destination. It was an amazing feeling. We were greeted with rapturous applause, singing and dancing, with small excited children all wanting to shake our hands. At the clinic, we busied ourselves erecting our tents under moonlight before we cooked ourselves some noodles. After we had eaten, we could not get into bed fast enough. We were totally exhausted, and we knew that the next day would be busy in the clinic. In the distance, we heard the sound of gunfire and learned later that it was from locals shooting hippos. These animals, although vegetarian, are extremely dangerous and are responsible for more human casualties than lions and crocodiles put together. A hippo would feed a large number of people in an area where many people die of malnutrition. I had come to realise why I had chosen humanitarian aid and healthcare as my mission in life. I have to admit that there were times when I questioned why I put myself in such a situation, but to see the appreciation of the people who were relying upon us for medical care and advice made me understand why it was all worthwhile. The next morning the clinic was buzzing with happy women and small children who otherwise would have no access whatsoever to even the most basic of healthcare. The most common health problems we saw were diarrheal diseases, respiratory infections and malaria. It had taken us seven hours to reach them. However, despite the fact that they were better adapted to their environment, faster and more practised at crossing this kind of landscape, in order to access any form of healthcare and advice they would otherwise have to make the same journey in reverse should they be sick, injured or caring for a sick child. The clinic had been re-supplied. The local population that relied upon it had been reassured that their healthcare needs would still be met. And, I had come to realise why I had chosen humanitarian aid and healthcare as my mission in life.